Original painting in acrylic on cotton, painting size 95x95cm, in wooden frame. This image was painted to record my own vision of the "Cosmic Tree", which appears in the stories and mythologies of cultures all over the world. It is a symbol of regeneration and the connectedness of all life. My vision took the form of a journey in four transitional stages (each depicted by one of the surrounding circular illustrations - anti-clockwise, starting from bottom left of the image). A recent astrophysics theory states that the Universe has the shape of a toroid (doughnut) - if this shape is placed horizontally inside a sphere of the same external diameter, the remaining space has the shape of a "tree" (as painted in the central circle). My vision led me to connect this form to the concept of the Tree of Life - a living blueprint that informs every living being, defining growth patterns, planetary magnetic fields and many other phenomena. 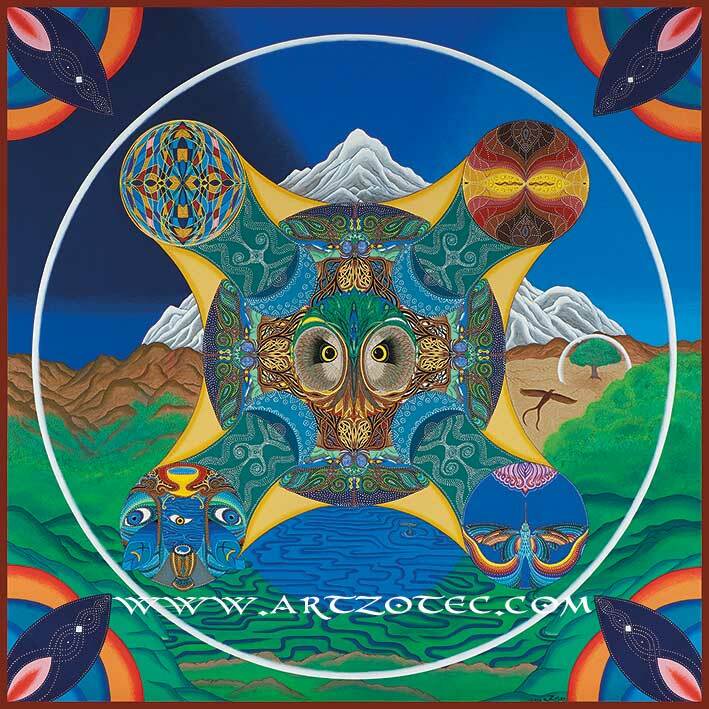 To read the full article "Visionary Art, Cosmology and the Tree of Life", please click here.